An HSUS investigator documented a pattern of mistreatment of primates at Texas Biomed, a taxpayer-funded institution. 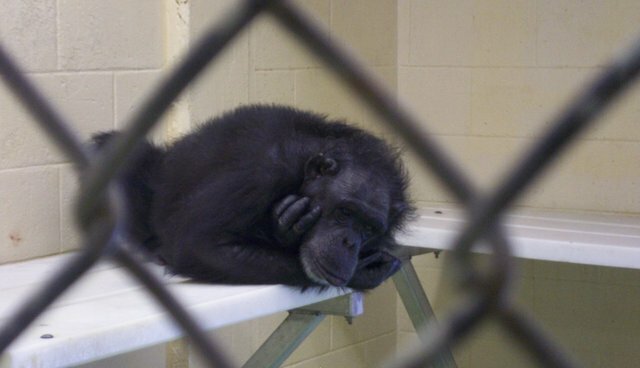 Photo: The HSUS Specifically, an HSUS investigator went undercover as an animal caretaker at Texas Biomedical Research Institute, a taxpayer-funded research institution in San Antonio that houses more than 3,000 primates for laboratory use. Over five weeks, the investigator documented a pattern of mistreatment of the animals, including primates who suffered unnecessary injuries and even death. The institution's standards of care frequently fell short of the federal Animal Welfare Act, with primates living in overcrowded and barren conditions, mothers and infants separated, and injured and sick animals not receiving timely medical care.A USDA inspection report has cited the facility for two cases uncovered through the HSUS investigation, including the death of an emaciated baboon from septicemia as a result of trauma, and repeated injuries to a female rhesus monkey that required her tail to be amputated.Numerous other problems were documented by the HSUS investigator, including: Primates were plucking out their own hair and over-grooming-both indicators of extreme stress. Our investigator, on film, documented dozens of macaque monkeys, including infants, with substantial bald patches as a result of these behaviors.Repetitive behaviors like pacing, spinning and flipping and severe aggression, resulting in serious injuries.Young infants separated from their mothers and housed nearby, resulting in constant cries from the infants and significant stress to the mothers. Lack of special consideration for the well-being of infants and juveniles is directly in violation of the Animal Welfare Act.Staff handling animals improperly, including hand-catching animals by their tail.Poor sanitation practices and lack of veterinary attention. Some animals were injured, one was severely dehydrated, but laboratory staff did not notice or report the problems.Laboratory staff showed the HSUS investigator an X-ray of a baboon with a stomach full of rocks. It is clear that the baboons at Texas Biomed are not getting proper animal care – stressed and underfed, they resort to consuming large quantities of rocks and feces.Extensive fighting within groups, resulting in wounds and other injuries to the animals.Texas Biomed has a history of problematic animal care, including the self-strangulation of a baboon and two macaques by door cables, a poor design that the facility failed to correct.The dismal life of primates in research is a topic we have frequently turned the spotlight on here at The HSUS, including last Friday's blog about maternal deprivation experiments at the University of Wisconsin-Madison. Primates suffer immensely when confined in research labs, and exacerbating those problems through neglect and mistreatment is simply wrong. It is time for our nation to move beyond using these highly intelligent, social animals for these purposes. Please join us in urging the agency to take strong enforcement action. We are also asking that the government retire the 22 federally-owned chimpanzees currently at Texas Biomed to sanctuary as soon as possible. An HSUS investigator documented a pattern of mistreatment of primates at Texas Biomed, a taxpayer-funded institution. Photo: The HSUS An HSUS investigator documented a pattern of mistreatment of primates at Texas Biomed, a taxpayer-funded institution. Photo: The HSUS Specifically, an HSUS investigator went undercover as an animal caretaker at Texas Biomedical Research Institute, a taxpayer-funded research institution in San Antonio that houses more than 3,000 primates for laboratory use. Over five weeks, the investigator documented a pattern of mistreatment of the animals, including primates who suffered unnecessary injuries and even death. The institution's standards of care frequently fell short of the federal Animal Welfare Act, with primates living in overcrowded and barren conditions, mothers and infants separated, and injured and sick animals not receiving timely medical care. Primates were plucking out their own hair and over-grooming-both indicators of extreme stress. Our investigator, on film, documented dozens of macaque monkeys, including infants, with substantial bald patches as a result of these behaviors. Laboratory staff showed the HSUS investigator an X-ray of a baboon with a stomach full of rocks. It is clear that the baboons at Texas Biomed are not getting proper animal care – stressed and underfed, they resort to consuming large quantities of rocks and feces.